The Festival Picture photo mission in Kingdom Hearts 3 is one of a number of Moogle photo missions you can complete. You can get these missions from any Moogle store. The Festival Moogle photo mission requires you to take a photo of the festival; the one in Kingdom of Corona. However, you have to take a very specific photo to complete the mission. This has been causing some problems for people. Our Kingdom Hearts 3 Festival Picture Photo Mission – How to Complete guide will show you exactly what you have to take a picture of, with screenshots to show you how we pulled the mission off. 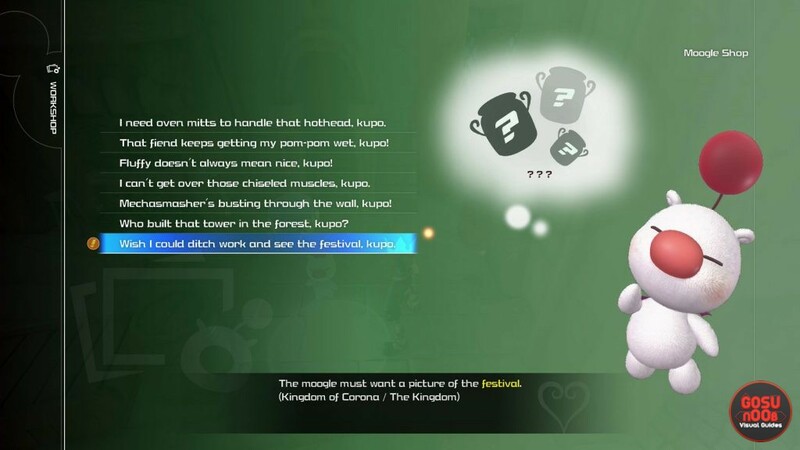 How to Complete Festival Moogle Photo Mission in Kingdom Hearts 3? To complete the Festival Picture Moogle Photo Mission in Kingdom Hearts 3, you’ll have to take a picture of the festival in the Kingdom of Corona. This is a very vague request, because the festival spans almost the whole town in The Kingdom area. Fortunately, the mission is easier than you’d expect. So, the first step is to go to the sixth fast travel point in the Kingdom of Corona, the one called The Kingdom: Thoroughfare. Believe it or not, you’re practically there. Walk past the Moogle Shop, and get your camera ready. In our playthrough, we centered the camera on the small tower that’s to the left of the archway in front of you that leads to the dancing minigame. However, we zoomed out completely, and made damned sure to get some of the little banners and flowers that are hanging overhead. Not sure about the flowers, but the banners do seem crucial to completing the Festival Photo Mission. To the best of our knowledge, this small area is the only place that counts for photographing the festival. That may not be correct, but still, play it safe. Then, just talk to the Moogle in the corner to get your reward. So, that does it for the Festival Moogle Photo Mission in Kingdom Hearts 3. If something else in the game is bothering you, check out some of our other Kingdom Hearts 3 guides. Among others, we have Red Box in Olympus – How to Open, Dark Inferno Secret Boss Location & Rewards, and Orichalcum Locations – How to Get Ore.